The origins of the Verona Carnival are lost in the mists of time. It can certainly be considered the most ancient carnival in Europe to this day, and involves the whole Veronese population in a passionate and lively way. Dating back to the late Middle Ages, the Verona Carnival (the original name is Bacanàl del Gnoco) has its roots in the times of Tomaso Vico, a 16th century doctor who left his testamentary legacy to distribute annually to the population of the San Zeno quarters (where the Basilica of the same name is found) food and goods. 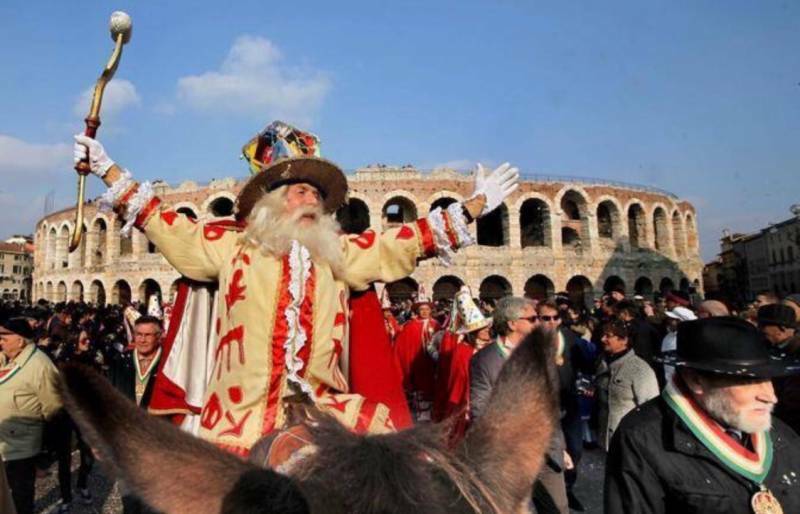 The program of the Verona Carnival 2019 is expected by many, young and old, fans and lovers of disguise, especially in beautiful Verona that is tinged with rainbow, thanks to confetti and streamers, starting from March 1st, better known as "venerdi gnocolar" (“dumpling Friday”) which officially opens the carnival festivities. Great parade of allegorical floats in the streets of the center of Verona, on this first day of carnival 2019 in the city of Verona, with meeting in Corso Porta Nuova to get to Piazza San Zeno, where the party continues until late at night to move, Saturday 2nd March, in the afternoon, in the Rione dei Filippini with the historical regatta that sees the Prince Reboano canoeing the Adige river, tickling the curiosity of visitors, tourists and Veronesi themselves. 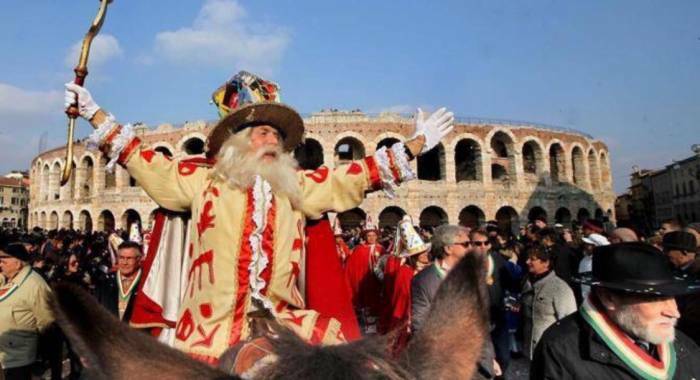 Sunday is not far behind, in fact, the morning of March 3rd, the Carnival moves "on the Liston" of Piazza Brà and, in the afternoon, the party heads in the historic districts of Verona and in the main centers of the province. How not to mention "Monday Pignatar 2019": the afternoon of Monday 4th March continues the festivities in the district of Santo Stefano where the party with the traditional distribution of minestrone and lots of music comes to life until the evening. The Carnival in Verona ends on the day of "Mardi Gras 2019" which, this year falls on 5th March. The “fat Tuesday” is the party that concludes the week of the "seven fat days" of carnival. The next day, Lent begins, the liturgical period of conversion and ritual penitence that precedes Easter. Taking the opportunity to visit Verona and surroundings during the Carnival holidays 2019 is certainly a stimulating and fun choice, even from a gastronomic point of view. How to resist the typical sweets of the Verona Carnival? The Ligurians call them "lies", the Tuscan "cenci", for the Marches are the "frappe" but for us Veronese are the "sòssole" and "galani" and "chiacchiere". They are sweets that date back to ancient Rome and that, even today, are synonymous with "carnival" and are found on the tables of Verona, Italians and more. Our country relais in the province of Verona is located a few kilometers from the city center. A peaceful place, perfect to regenerate after a beautiful carnival day in Verona. Our eleven themed rooms are ready for booking, to welcome you and offer services aimed at relaxation, immersed in the green countryside of Verona. Do not hesitate to contact us to book your stay. ⭐⭐⭐⭐⭐ Agriturismo molto bello,con personale delizioso e sempre disponibile. Camera matrimoniale stupenda e spaziosa. Un week-end veramente rilassante!